On Monday morning there was quite a serious car crash just 70 m from our home. We didn't know about it until later in the day when it was reported on the local news. This may seem like an unlikely story, and you may wonder how it could be possible that we would miss such a thing so close to our home, but this actually makes a good example of how successfully Dutch residential areas are insulated from the effects of major roads, even when they pass nearby. The crashed car, by the closest bus-stop to our home. Photo: RTV Drenthe. The huge road on which the crash took place. The car in the photo above is in the same position as the bus in the photo below. 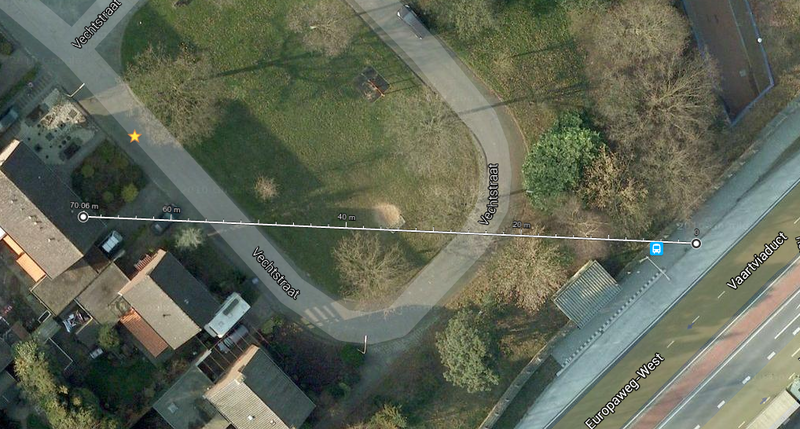 Our home is on the left of the Google Maps measurement tool, the crashed car was on its right. The road on which this crash occurred is the ring-road of Assen. This has a 70 km/h speed limit (43 mph), this being the highest speed limit that you will generally find is allowed on a road within a city in the Netherlands. The relatively low speed for what is not far off an urban motorway does of course help to keep noise levels down, but you'll also note that the photos above show a noise barrier alongside this road. The barrier is extremely effective at reducing noise, and also makes it next to impossible to see the road. This is why it was possible that we didn't even know the crash had happened until later in the day. The cycle-path which we use to ride into the city is visible on the image from Google Maps above. It passes almost exactly under where the crash occurred so cyclists who were riding here even as the crash occurred may well not have noticed it happening, and will not have been put in danger. By using this tunnel, cyclists not only cycle in a safe and almost entirely noise free environment but also skip past a set of traffic lights. The tunnel and noise barrier between them reduce danger for cyclists, reduce noise and also reduce how often cyclists have to stop on their journeys. These factors add together to make cycling more pleasant and relaxing and also to offer the prospect of faster and shorter journeys if you travel by bike. Measuring noise levels - how effective is the barrier? It's quite straightforward to measure the effect of a noise barrier if we have the right equipment. The photo on the right shows my SPL meter measuring the sound level in our front garden, a mere 50 metres from the road. The glimpse of blue in the centre top of the photo is as much as we can see of the noise barrier, which is otherwise completely invisible due to trees. My meter barely ever registers any noise here. Set on the lowest possible range of 60 dBA, the needle very rarely moves from the -10 dB setting due to traffic noise, indicating a level which barely ever rises above 50 dBA. Birds in trees nearby make a subjectively louder sound than traffic noise. 50 dBA is the sort of level sometimes described as being equivalent to an "average home interior" or "moderate rainfall"
By comparison, on the other side of the barrier I have to adjust my meter's range so that it is not overloaded by the sound. When standing there, the meter often shows figures of 82 dBA or higher as I am passed by cars, and can peak higher yet for buses, trucks and motorbikes, so it would appear that our front garden is at least 30 dB quieter than the road-side. Readers with a physics or maths background will probably have thought of the inverse-square law by now. According to the inverse-square law, you would expect that a ten times difference in distance from the source of a sound would bring a 20 dB difference in sound level, which is a good part of what I have measured. However, you have to be careful with that assumption in this case. The inverse-square law applies only for measurements in a free field and with a point source. Noise from aircraft travelling overhead is attenuated according to the inverse-square law because these conditions apply, but when considering noise from motor vehicles on roads we usually have neither a free field (airborne sound bounces from the road more than it propagates through it) nor a point source. A busy road with many cars on it (such as during rush-hour when I made my measurements) more closely approximates to a line-source than it does to a point. Noise from roads is so pervasive in large part because it is not attenuated by distance to the extent that you might hope it would be. Besides, if you need further evidence of the effectiveness of the barriers, I should point out that my meter still measures only slightly over 50 dBA even if I stand very close to the quiet side of the barrier, when my distance from the noise source (cars on the road) is only about double that of standing on the noisy side of the barrier. It has been shown that air pollution from motor vehicles is also reduced in the local immediate downwind area behind noise barriers. This is due to the pollution being lifted to a higher level where it is blown away more quickly. We breath cleaner air as a result of the noise barrier. This is all part of creating a pleasant residential environment. Research has found that streets which are quiet (both in terms of through traffic and noise) lead to better relationships with your neighbours. On our study tours we demonstrate the surprising quietness of Dutch residential areas and also how even motorways with vehicles travelling at 130 km/h (80 mph) now cause comparatively little noise nuisance. How much do the Dutch really cycle ? How is it is measured ? Which are really the top ten cycling cities of the world ? Lists are popular on the internet. As a result, there are often attempts to make lists which rank such things as cycling cities. Such lists are always false. There is no common methodology between different countries and so there is no reliable way to make a ranking. In reality it's quite difficult even to pin down the "correct" figure for one city in one country, let alone to find comparable figures for a range of cities in different countries. I've intended to write about this problem for several years but a recent online discussion led me to a Dutch language article about methodologies for measuring modal split in the Netherlands which made a very good start towards an explanation so I asked the Fietsberaad if I could translate it. Beneath the article you'll find an additional summary from me. Do Appingedammers make 18%, 30%, 38% or 53% of their journeys by car? Modal split figures show the relatively popularity of different transport modes. Modal splits can be measured in a number of different ways. The modal split usually shows the proportions either of kilometres travelled or of journeys made as car drivers, car passengers, by train, bus / subway or tram, bicycle, moped and by walking. The statistics often make use of OViN, a statistics from the BCS, based on a survey of a representative sample of residents of the area being measured. The accuracy of this technique is known to have limitations. the different groups or time periods which the modal split covers. the modal split according to the number of kilometers traveled per mode. Because journeys by car, train, bus, tram, and subway are on average longer than journeys by bicycle or by walking, their share of the modal split becomes when figures are given per kilometre travelled rather than per journey. There are many methods to gather data to calculate a modal split. For example through counters on the street or through surveys. in the future there will perhaps be more use made from other sources of information, for example details from mobile telephones or from public transport subscriptions cards. From these figures we draw a conclusion that the modal split changes very little and that the number of cycling journeys has stayed the same. The local government's own figures show a different picture. For 15 years, Rotterdam has counted cycle usage at fixed points in the city and found consistent growth in cycling while the car traffic in and around the inner city has stayed the same. Cycling traffic around the city centre of Rotterdam has grown by around 60% in the last ten years. According to the figures for kilometres travelled (table above) cycling kilometres have grown by 11% while the growth for all transport modes is 7%. This could indicate that people are now more willing to travel for longer distances. When we look at the error margins (see below) we find that these differences are not significant: but there could still be growth in the numbers of journeys or distance being made by bicycle. That cars are used more in the first example than the second can be easily explained in that fewer people make the longer journeys between towns by walking and cycling. Another distinction is in the presentation of the figures. The second example separated train travel from other public transport. Not only is the period different but also the data sources differ. The tables make use of the new set of OViN data which used the same methodology as in previous years. Walking was missed out from the city's own figures. It's a significant part of the total and missing this out made cycling, public transport and driving seem more significant than the reality. To finish, we have error margins. Figures are often presented as if they represent an absolute truth, but that it very often not the case. Any sample or measurement will not only have some errors, but also they can never represent all journeys made. In sampling people typically aim for a 95% confidence interval. Such a confidence level indicates that we have a high degree of confidence that our result is relevant. It means that we are 95% certain that the true figure is within the intervals given. Note that is can say nothing about any individual sample nor can we say that 95% of samples are within the interval (the language of the Dutch original is slighty confusing). *) In this table the modal split calculated for journeys by car is reduced by considering the effect of the error margins for other modes. There are many possible variations. This example is given to show the sensitivity of modal split data. In Appingedam there are few journeys by public transport. This is also a small town and therefore the sample size is small. These factors result in a large margin of error. The relatively high error margin makes meaningful comparison with other towns difficult. For public transport it's impossible. *) Here the modal split is calculated for car journeys is reduced by adjusting all the other modes to their maximum values using the relative error margin. There are many possible variations as to how this could be done. the idea is to demonstrate the sensitivity of the figures to the error margins. Beside the inaccuracy due to sampling, there is also another source of error due to how correspondents to surveys under record their shorter journeys. For instance, people forget about the short walked journeys from the front door of their home to their car and between car parks and shops. From research is is become apparent that due to under-reporting figures for walked journeys should be 1.57 times higher than they are reported. The examples given above demonstrate that there is no single modal split figure. Readers must always look at how the statistics were gathered and what they relate to. On the basis of the CBS figures shown above, we can answer the original question by saying that Appingedam residents make 18, 27, 28, 30, 31, or 38 % of their journeys as the driver of a car. Or by saying that 53% of the distance that Appingedammers travel is as the driver of a car. 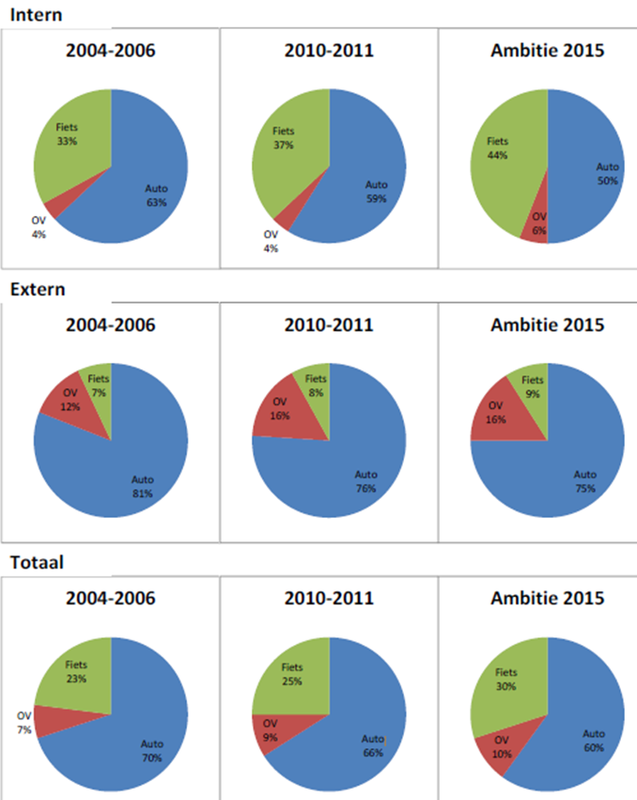 All of the above relates to how the Dutch collect data about modal split in the Netherlands. As you see above, there can be significant variations in figures even from one methodology, but even here there are actually different methodologies which result in different results and those results can have different interpretations. As a result, different figures can be found for the same Dutch town, and this means it is difficult to reliably compare different towns. i.e. it's difficult to make sensible comparisons even within this country. However, at least within this country it is usually possible with a bit of effort to find data which has been collected in the same way in different places, though even when we are comparing Dutch cities with each other we must still be careful about error margins as they can be more significant than the apparent reported differences in modal splits. Dutch methodologies as shown above (especially OViN) usually can be expected to take into account the modal split for the entire population being considered. By this I mean the entire town or city which is being considered and everyone of every age group within that location (group). They also usually take the entire year (i.e. winter and summer) into consideration (period). For instance, anonymous looking bicycle counters in the Netherlands are typically put in place for a year in order to gather counts which will not be unduly influenced by the weather on one day vs. another. These Dutch methodologies are used to build so accurate a picture as possible so that while the results cannot always be compared very meaningfully with other towns, they should be comparable over time within the same location. This makes it possible to build up a picture of progress over time. Other ways in which figures can be collected so that they are not times you'll find figures quoted which relate only to journeys in part of a city. I've also seen examples of counts performed only on sunny days, or on peak days for student traffic, or where part day counts are extrapolated as if they relate to the whole day (all those things and more in one instance). Such figures are more applicable to use for politicians to placate local cyclists or to boast about what they claim to have achieved, or for marketing people to sell their city to cycling tourists. Lastly, there's a tendency in some places to publish targets aggressively and it is sometimes the case that people go on to re-publish targets as if they have been met. Anyone can set a target. Achieving it is something quite different. Whatever caused the confusion, presenting figures in a way which inflates them does not help to further understanding. It hides problems and does nothing to further cycling. Having figures from inconsistent methodologies or which do not cover the entire population makes it difficult to tell whether real progress is being made. In the past I've criticized the use of modal split statistics gathered elsewhere and I'll probably continue to do so. For instance, I've written about how statistics from Cambridge, New York, London, and of course Copenhagen (multiple times) have been published and used in a way which confuses rather than enlightens. Copenhagen is an extreme case because while in reality somewhere around 1/5 to 1/4 of all trips are genuinely by bike in the city this has been reported by various means as anything up to 40%. 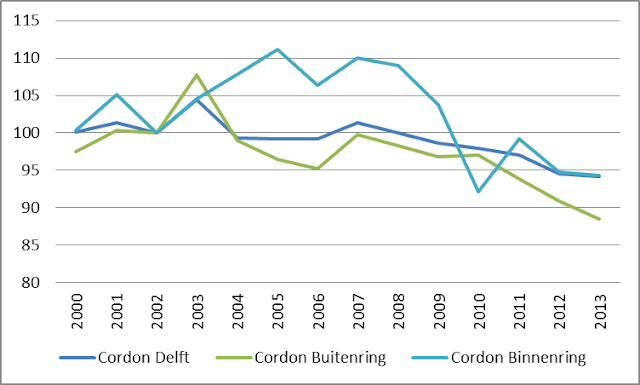 Sadly, the Dutch don't always publish useful figures either. I've criticized figures from Amsterdam (38% pushed to 47%) and Groningen (50% reported as 59%) in the past when they missed out walking from their statistics to produce a higher figure to present internationally, showing a higher cycling share than exists in reality. 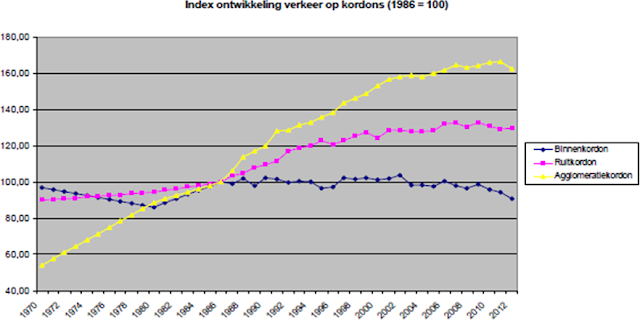 The figures produced by 's-Hertogenbosch used as examples in the article above show more of the same (actual 27% reported as a range of figures stretching up to 44%). These figures have also been reported elsewhere as fact and indeed I once reproduced that claim myself. We all need to be skeptical about claims, especially when they are made in a way which could be seen as promotional. Even modal-split data which appears to cover the same group and period in different countries, and which is gathered in a reliable and consistent manner will vary so much in methodology that comparisons made are largely meaningless. In reality, figures from different countries vary greatly in group and period and this makes the comparisons completely unreliable. As result, any ranking produced on the basis of the results of such a comparison will be meaningless. While I have on occasion quoted figures from Dutch or other cities, you won't ever read a "top ten cycling cities" list on this blog. I've never ranked cities in this way because it wouldn't mean anything. Such a ranking this could only create a false impression of having more information than actually exists and this would mislead readers. People who produce lists of "top cycling cities" do so either out of ignorance about how these statistics cannot be compared or for commercial reasons. i.e. to sell something. 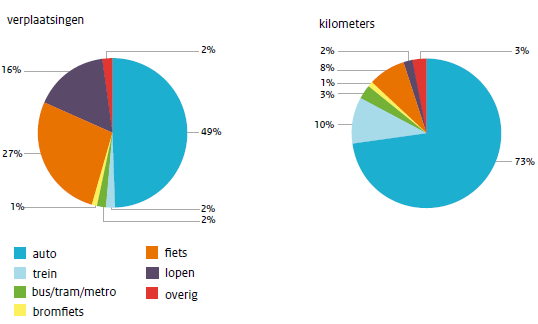 How much cycling is there in the Netherlands ? The overall figure for cycling in the Netherlands as a percentage of trips has not varied appreciably in many years. 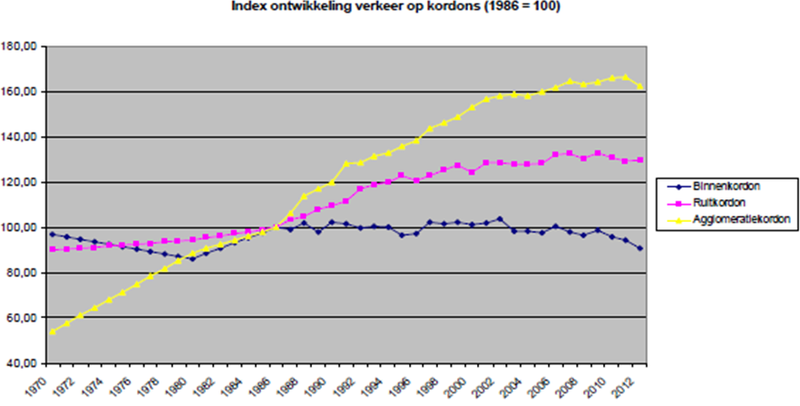 According to the graph above, 27% of all trips in the Netherlands are by bicycle. This is the highest figure for any country in the world (certainly amongst relatively wealthy nations where people have a choice of transport modes). If we're interested in green modes of transport, we can add on the 16% of journeys made by walking and note that relatively prosperous Dutch people make a massive 43% of their journeys by human power - a reasonably reliable statistic which is something truly to be proud of. Using a different methodology, the Flash Eurobarometer came to a similar conclusion about the overal cycling and walking share of the Netherlands, left, in orange. This is great news, however we should always also recognise the flip side. If 27% of journeys are by bike and 43% of journeys are by the two genuinely green modes (walking and cycling), then that still means that 73% of journeys are not by bicycle and 57% are by non-green motorized forms of transport. If we look at trips by distance, this gets worse. The Dutch cover 73% of their distance travelled by private car alone. While what has been achieved in the Netherlands is wonderful, there is still more that can be achieved. What's more, what has so painstakingly been achieved could still quite easily be lost. There is no space for complacency.